Perhaps a friend or your child’s teacher has pulled you aside with bad news, your child is hitting, biting, kicking, pulling hair or pushing, again. Before you throw your hands up in frustration, embarrassment or self-defense read on to better understand the root causes of your child’s behavior and how to nip it in the bud. The International Journal of Behavioral Development (see citation below) published a study today linking aggressive behaviors in daycare and preschool settings with a child’s genetics. While their point that some children are predisposed towards exhibiting aggressive behaviors is valid, I caution parents against blaming themselves or giving up on trying to curb the negative behaviors because you feel out of control and helpless. Beware also of blaming the victim child or the child’s teacher. Your child’s behavior is his own, but he is not alone in learning how to find other ways to problem solve. Nor is your child a “bad boy” or a “bad girl”, instead he is a child in a difficult phase. With a little intervention, this phase will be just a memory. Children always have a reason fueling negative behavior and these reasons are the root causes of the behavior. A child’s emotional intelligence and communication skills are limited. They are not always able to understand their own emotions and create a healthy plan of attack. Negative feelings (sadness, over-stimulation, loneliness, anxiety, anger, etc…) instead scare young children. They feel powerless to understand what is happening and so some choose to hit, kick, pull, push and bite. Let’s explore the root causes of these behaviors and walk through some solutions to address the problem. Preschool and child-care environments are very exciting for young children and some can feel overwhelmed by engaging within them. Variations in personality will determine whether or not your child will enjoy large groups or prefer small social circles. No one preference is better than the other, but special considerations for temperament may need to be taken into account if your child is behaving aggressively towards his peers. Ask his teacher when these interactions are occurring. Is your child always surrounded by many other children in a chaotic moment when he bites? Or is she pushing in one-on-one interactions? If chaos seems to be the underlying culprit, then you made need to consider a change of scenery for your child (smaller class size, home-based care, different education model, etc…). If you have ruled out feelings of over-stimulation as the root cause of your child’s negative behavior, you will next need to consider your major life changes. Children adsorb what is going on in your lives, even if you are trying your best to shield them from your stressors. Have you changed jobs, moved homes, added a new baby, experienced marital issues, family issues, endured a serious illness, suffered a major loss, etc…? Has your child encountered any direct stressors (potty training, change in child care, new sibling, etc…)? If the answer is yes, help your child to process these events and transitions with conversation, books, extra patience and, if necessary, the help of a professional. Before you overrule this root cause , consider that the development of empathy is a very complicated process that takes years, if not decades, to fully mature. Many adults do not have a “complete” understanding of empathy. Take a breath and accept that empathy comes naturally to some and takes more practice for others. In most cases, nothing is wrong with a child who needs extra help developing empathy. Keep in mind that if your child is using his or her body to harm others, then lack of empathy is a root cause of the negative behaviors (but is not always the primary cause). Narrate his/her experiences to help him process his emotions. (For more information on narration, click here.) Also narrate your own experiences. Avoid aggressive speech and actions (including spanking) around your child. Modeling is a very powerful tool. Read stories about resolving problems and feelings. (Author Trace Moroney has a lovely series called, “When I am feeling….”). For more information about age appropriate displays of empathy and tips on how to help your child develop empathy, click here. Note that this root cause is inexperience and NOT ineptitude. 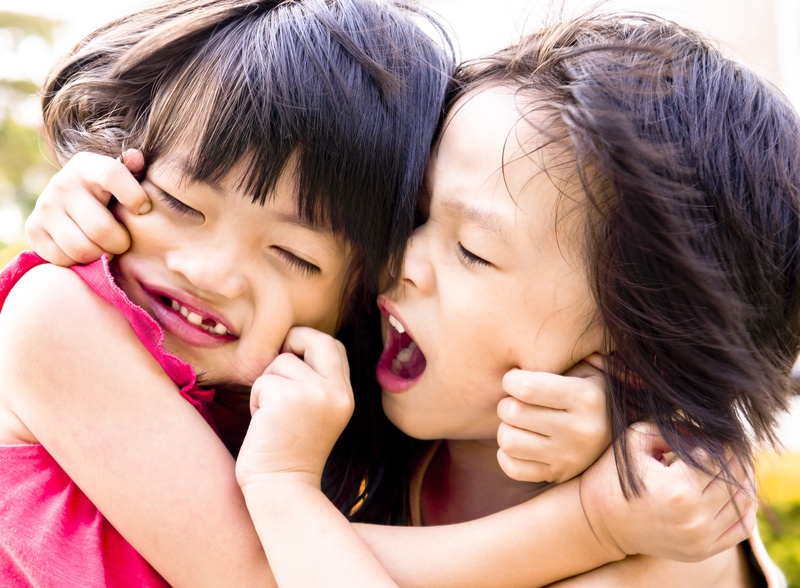 A child who displays aggressive behaviors is not necessarily socially inept, rather inexperienced and simply needs a bit of training in the art of friendship. Social relationships can be one of life’s greatest joys, but they are also complex and require work to establish and maintain. Some young children need extra coaching to learn social skills like how to make a friend, conflict resolution and sharing. You can offer a child social coaching through role play, questioning tactics and stories. Role Play: Use a stuffed animal as a pretend friend and act out how to make a friend, ask for a turn, offer up a coveted toy, help a friend in need, etc… It may feel silly, but it is a very meaningful experience for the child. Give them phrases to use when talking to friends (ex. “Do you want to play with me?” or “I don’t like that game.”). Have the child practice the phrases. Take them to a playground to practice on real friends before expecting them to be able to preform their new skill at preschool or daycare. Questioning Tactics: If your child is more resistant to the idea of being coach, pretend as though you need help making a friend, asking for help, taking a turn, etc… and ask your child for advice? What should you do first, second, third, etc…? Listen to them and repeat their helpful solutions. They will be taking note of the solutions that you highlight. Stories: Make a story up or find the perfect one from the book store. Read or tell stories to your child about social exchanges that teach a lesson about what should and should not be done. This option is very positive and non-confrontational. If you have tried the above solutions and worked your way though the four root causes of aggressive behaviors, then it may be time to contact a professional for an evaluation. Persistent social discord is a symptom of some developmental disorders and conditions. Early intervention is important and will improve your child’s outcome with therapy. You can also talk to your pediatrician about your concerns.